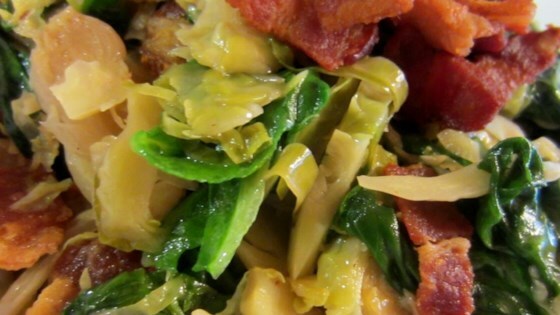 "The warm bacon dressing makes this Brussels sprouts and spinach salad very tasty. You'll be surprised how eager your family will become to eat their veggies!" Place bacon in a large, deep skillet. Cook over medium high heat until evenly brown. Crumble and set aside. In a medium sauce pan, steam Brussels sprouts until tender. Heat the remaining fat in the skillet over medium high heat and add the Brussels sprouts and caraway seeds. Stir for 1 to 2 minutes, or until the sprouts are tender. Remove the skillet from heat, stir in the oil, vinegar, and sugar. Stir, and add the spinach. Saute the mixture over moderately high heat for 1 minute or until the spinach is wilted. Season salad with pepper and sprinkle with bacon. Serve warm. I don't often find interesting brussel sprouts recipes...I don't care for carraway seeds so I substituted toasted sesame seeds and I added carmalized onions and my family and I loved it. I added onion as the recipe made me think of german potato salad which has onion. Very good! CARAWAY SEEDS STINK- USE SAGE AND IT'S AWESOME .THAT'S MY STORY AND I'M STICKIN' TO IT! i made these for xmas dinner and i do have a fussy lot in my house. they were all crazy about those brussell sprouts. This was awesome! Next time though, I will omit the caraway seeds, as the smell totally turns me off. But even with them, once I tasted, they were soooo good!